I found these classic library chairs in October. I had been looking for a desk chair in this style, but with arms and wheels. But these were a close second. And there were two. Try as I might, I just couldn’t find a spot in my home for these. And believe me, I tried! 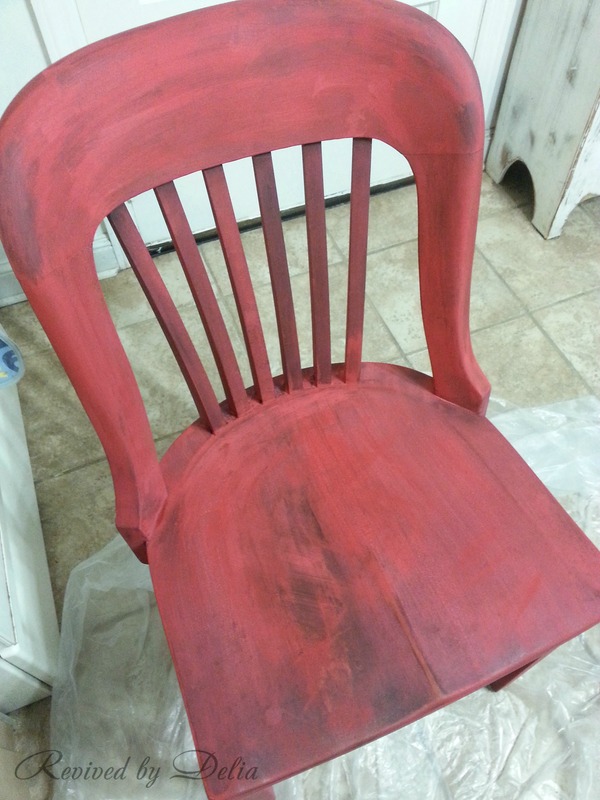 I decided to paint them a bold chippy red – Miss Mustard Seed Tricycle Red to be more precise. Rather than ramble on, I will simply say, I bought, I painted, I sanded, I waxed, I buffed and DONE! This pair of chairs will be for sale at Rebecca Christine’s Consignment Boutique this week – just in time for Valentine’s Day! These are pretty the way they turned out! I like how the old dark finish shows through…too bad you couldn’t find room for them! I’m sure they won’t be at that boutique for long :0) Hope you have a great week! They’re so pretty! I wish I lived closer…I would absolutely buy them for my office! Beautiful! Those have so much character; excellent work! Red delicious! Love that patina you achieved. Oh , I wished you lived near me. Love, love, love! These look great! I love the chippy red. I love the results, so I have to ask for details… Does the waxing make it more durable? And the buffing just was to really rub in the wax, was it? 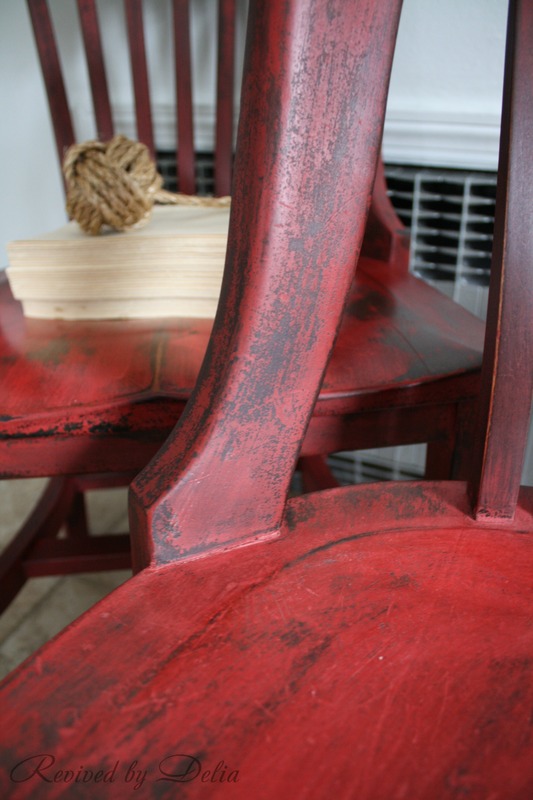 Hi Yana – Yes, waxing makes the finish more durable, and also brings out the depth in milk paint. 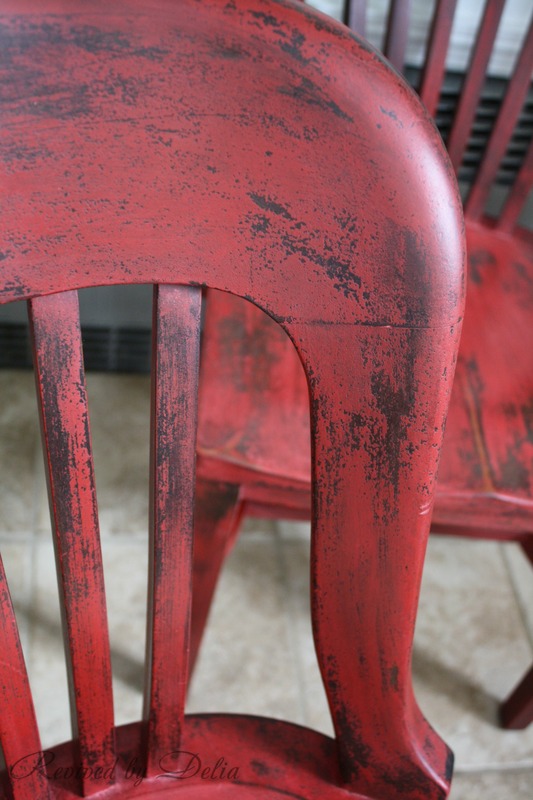 When milk paint dries, it’s matte and kind of powdery. See the second picture above. That was after painting, but prior to chipping, sanding, or waxing. Waxing brings out the color, halts the chipping, and gives it a durable finish. After the wax sits a bit, you have to buff it off to give it a silky finish. Hope that helps. I love them in red! Fantastic job! Thank you all for the lovely comments. I’m glad you like these happy chairs! So much better in red! 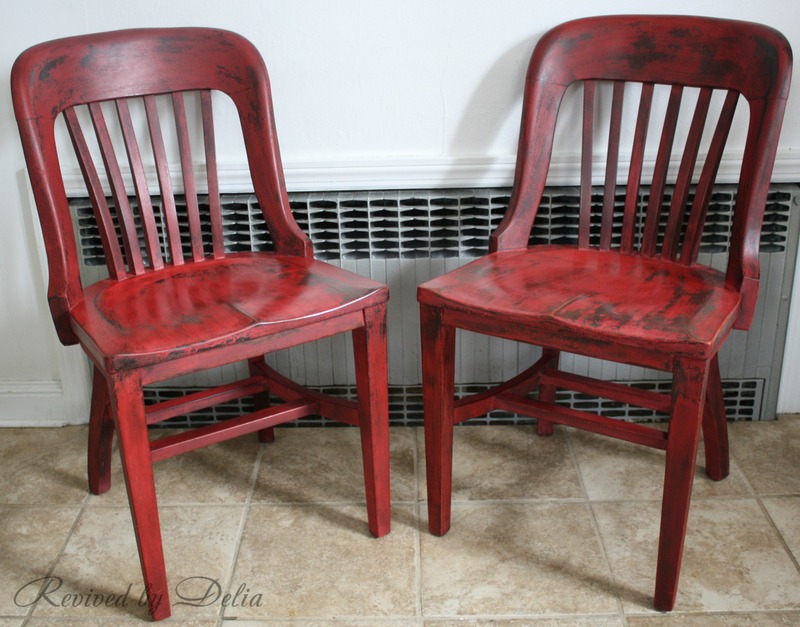 Red was the perfect color for these awesome chairs! Love these chairs! The perfect shade of red. Hi Gina – A good paste finishing wax gives a nice finish. I will be sharing the brand I use in an upcoming post, but even Johnson’s Paste Finishing Wax gives a nice hard finish, and you can find it at Home Depot or Lowes. I’m glad you enjoy my pieces, thank you for the compliments. Gorgeous redo! I love the shape of the chairs and red was a great choice! I am sure they will sell quickly at the boutique! These turned out beautiful!!!! Found this on the Scoop! Please come share this on DIY Sunday Showcase! I cohost over there and the party is open now! Hope to see ya there! Sorry I forgot to attach my address….silly. OK OMG I’m a space ball….you did share it with us! I pinned them to our board!!! Thanks for sharing with us! Thank you for sharing! You are right! They could be cousins! Holy crap! I am in LOVE with these! I wasn’t sure about them with just the paint, until I saw your photos with the top coat. Stunning!! Hi! i am looking for a paint color to paint our island stools and this looks wonderful. I have ZERO experience with milk paint. Can you recommend a link to learn about it. Our chairs are currently in a natural finish. Do I need to paint them dark first and then apply the chippy red? And, which paste did you recommend? I have a Home Depot and Lowes here. Thank you for the help!!!! Hi Kim! I do love MMS Tricycle Red. It’s a beautiful true red, just be sure to mix frequently as the pigments settle. If you don’t, you may find that the color gets more yellow towards the end. I would read thru Miss Mustard Seed’s tutorials and FAQ on her milk paint site ( http://www.missmustardseedmilkpaint.com ) before doing anything as milk paint is very different from say, a latex. Also, you’re not guaranteed to get a chippy finish. 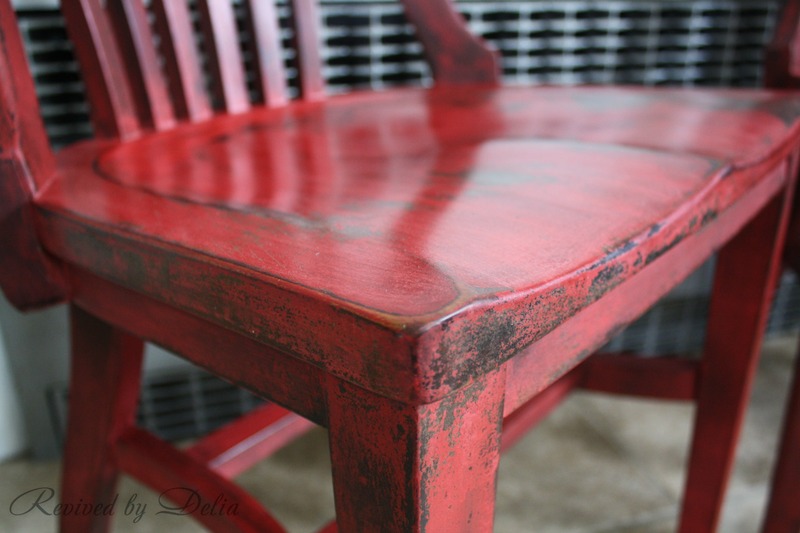 If the finish on the stools currently is “shiny” your chances are better. 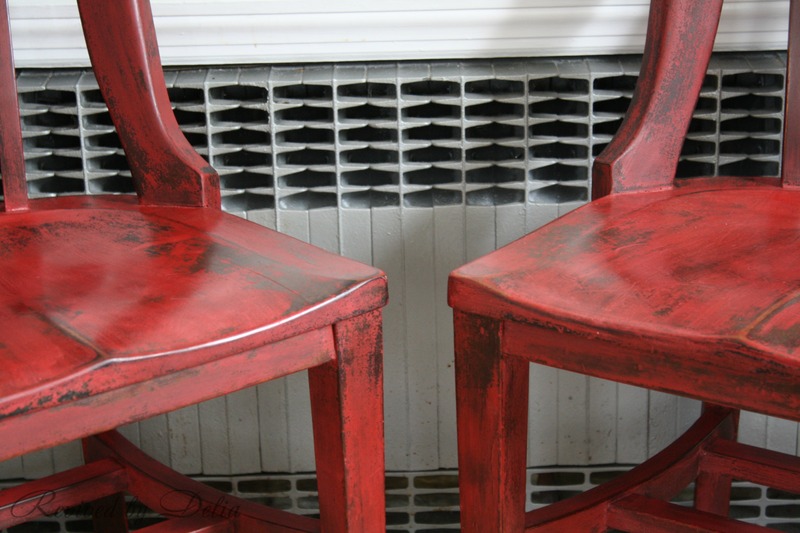 But if the stools are raw wood, the milk paint will absorb into the wood similar to how a stain would. For wax, something simple like Johnson’s Paste Finishing Wax will work just fine. You can find it at either Lowe’s or Home Depot. 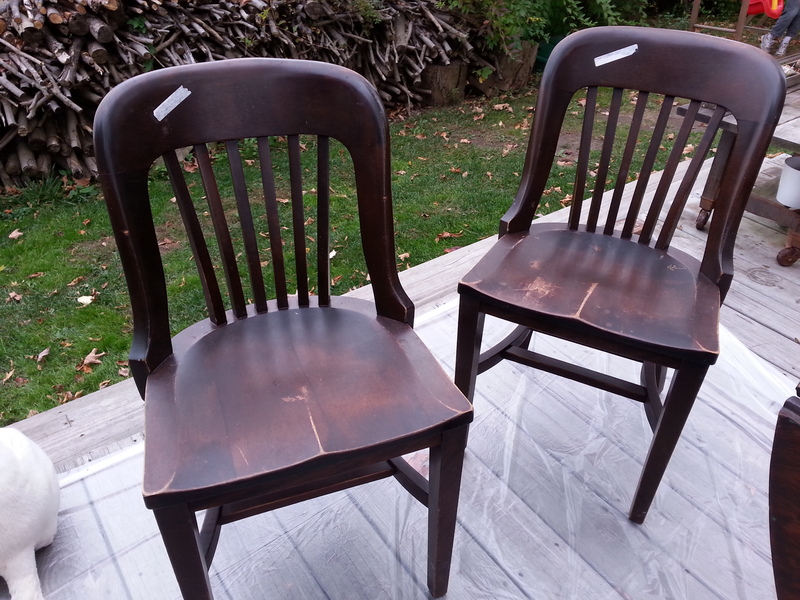 One last thought… If the stools have a lot of rungs, you may want to think about how much work it really will be… Chairs & stools are my dreaded pieces because they seem small and easy but often take as long or longer than larger pieces. If you don’t have your heart set on trying for a chippy finish, you could always spray them (with something other than milk paint). Just a thought. But thank you for looking at my site, and taking the time to comment!